United were looking to progress to the UEFA Cup quarter finals for the second consecutive season. To do so, they would need to overcome the Germans, Werder Bremen. A side that included German international Rudi Voller. The conditions for this match were poor, with underfoot conditions very soft. It was clear from the start that passed would need to be hit with double the force to ensure the ball got safely through the mud. Thankfully for United, they seemed to realise this relatively quickly. Hamish McAlpine had a tactic of launching long balls on top of the German defence. 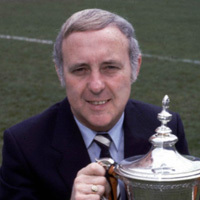 United managed to force four corners in the first six minutes, but not much came from any of them.United almost achieved a quick breakthrough when Gough, taking a pass from Sturrock, sent in a low cross which Dodds hit narrowly past the post. 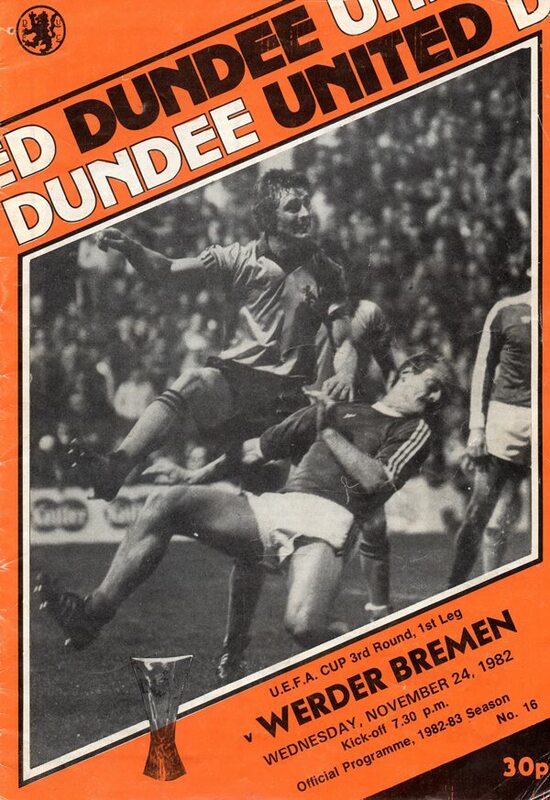 In 15 minutes the impressive Tannadice opening was rewarded with a goal. Ralph Milne flicked an Eamonn Bannon cross high into the net. 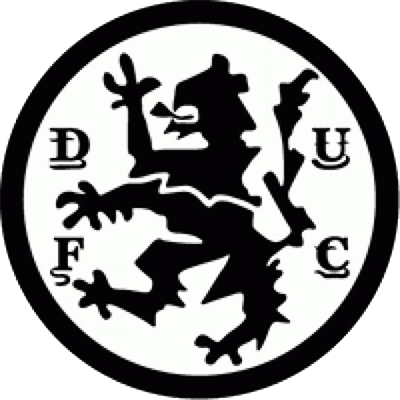 At the other end in the second half, a Rudi Voller shot came off Paul Hegarty and Norbert Meier slammed home the equaliser and a dreaded away goal. During a furious final 25 minutes, Dave Narey put United back in the lead with only eight minutes left, chipping in from 25 yards. Burdenski got a touch to it but couldn't keep it out the net. There was still time for Ralph Milne to smash one off the post, as the score remained 2-1. United, below par though they undoubtedly were, managed to keep their UEFA Cup aspirations alive after a nervous 90 minutes. It need a great deal of courage and while they were a long way short of the exciting team they can be, the condition may well have had a lot to do with it. Tonight is yet another big occasion for everyone at Tannadice. Some may say possibly even more vital alter our exit from the League Cup. I don't necessarily subscribe to that viewpoint. On our day, we are good enough to have reached that final but ordinary performances have crept in from time to time to sabotage our quest for honours. In normal circumstances a 3-0 victory, whether achieved home or away, would be highly acceptable, but last Saturdays performance was a big disappointment. Over 90 minutes we created many chances which we failed to convert, whilst the fact the defence recorded a shut-out was almost entirely due to Hibs failings up front. I had anticipated a more awkward match than in our last two outings against the Old Firm with Hibs adopting a 4-4-2 formation in an attempt to frustrate our efforts. However, too many of our players failed to display the right attitude and consequently our performance suffered against the Easter Road side. As you will have read in the Press, I made public the fact that I fined ouite a few of the players, even although I dislike giving publicity to such matters. There were several reasons for my actions. First, I felt it best to let you, the fans, know that the attitude adopted by some of the players will not be tolerated. I still believe they are the best I have here but it would be less embarrassing to me if I could leave some of them out rather than fine them. Unfortunately, the importance of every game dictates that I must field my strongest eleven every week Some experienced managers for whom I have great respect, considerit more important to blood young players, results being of secondary importance. That is a point of view I agree with to an extent, but the overriding factor must be to win every match. The attendance at the Hibs match was some 2,000 more than we had expected and I am acutely conscious of the fact that you did not get value for money, especially with so many leisure pursuits to attract the public's money. The recent publicity surrounding the financial plight of several clubs makes it absolutely clear to me that nothing but the best will do in every minute of every game. It is common knowledge of my belief that we are short of a couple of players if we are to satisfy the public in every match. Let that therefore, be a warning to the current first team occupants that I'll be lookiing to John Clark, Jimmy Page John Reilly and Alex Taylor to replace them in the future instead of my imposition of any financial penalties. As I have requested on previous European occasions, patience must be the order of the day. 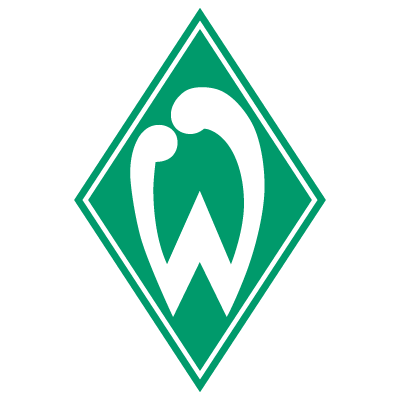 Werder Bremen will prove exceptionally difficult opposition with very adaptable players. If our players display the same attitude as in the recent games with the Old Firm and given the run of the ball we have reason to hope to make further progress in this competition but a repeat of the 90 minutes against Hibs will certainly not good enough.